Eureka! E! Power System And N!ergy Tent | OhGizmo! By Andrew Liszewski on 03/07/07 • Leave a comment! It seems the simple days of camping with just a sleeping bag, a roaring fire and the stars above are long gone. Nowadays you need to bring along all the comforts of home including TVs, DVD players and computers. But if you still want to ‘rough it’ by sleeping in a tent then Eureka! has you covered. Their new E! Power System can be used with their N!ergy tent which actually comes with three factory installed 12-volt outlets inside. The E! Power System is comprised of a central rechargeable power pack that can feed electricity to the three 12-volt outlets and a separate power switch that can be used to selectively turn the power on and off for each one. The outlets also glow with a blue LED making them easy to find when it’s dark and also serving as a handy night light. When it comes to wiring the N!ergy tent uses special wiring sleeves for safely running the power cables while concealing them at the same time. The Eureka! 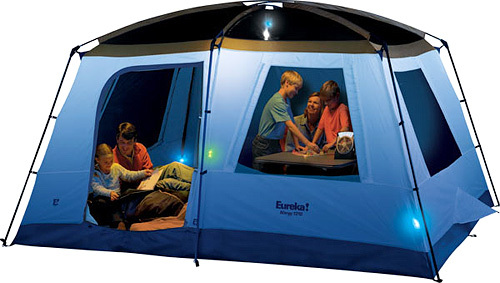 N!ergy tent includes the three 12-volt outlets (pre-wired) and is available for about $249. The E! Power System Power Pak is sold seperately and will set you back an additional $50.